This low carb lemon tarragon chicken is an amazing combination of flavors! This post contains affiliate links, which means that at no extra cost to you, I can make a tiny bit of money to help support this blog. Thank you! When I roast a whole chicken, my favorite ingredients to add while roasting are a herb butter (usually parsley or tarragon) and lemons. So this recipe encompasses all those flavors – plus butter and cream! 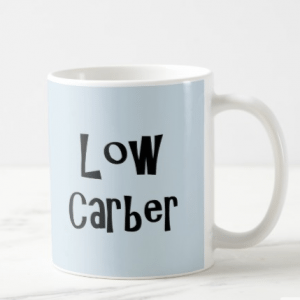 If you’re following a low-carb-high-fat diet – this dish is particularly good for you! Add butter and a little oil to a skillet and place over a medium-high heat. When melted and sizzling, add some chicken breast chunks (or strips, if you prefer) and some chopped fresh tarragon. Cook until the chicken is cooked through, turning regularly. Add heavy cream to the pan and let it bubble up. Reduce the heat and let it simmer and reduce for five minutes. Add lemon juice, salt and pepper to season. This lemon tarragon chicken dish would wonderful served with some shirataki rice, some steamed green beans or some roasted broccoli! 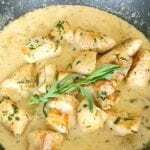 This delicious low carb creamy lemon tarragon chicken has an amazing combination of flavors! 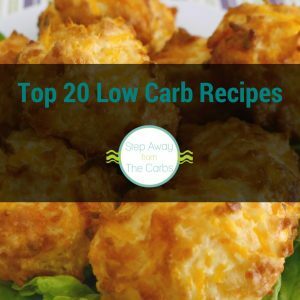 Keto, LCHF and gluten free recipe. Melt the butter and oil in a large pan over a medium-high heat. Add the chicken and tarragon, saute until the chicken is cooked through. Add the cream, let the sauce bubble up, then reduce heat and simmer for 5 minutes. Add lemon juice and salt and pepper to taste.